It was time to tackle the guest bath. This was not a job we were looking forward to as it was an original bathroom from the old house which meant all kinds of renovation gremlins were no doubt hiding in wait for us. So far we have just closed the door on it and focused on other things, we ripped out the old bathroom fittings a good 3 months ago and have basically ignored it since. Well the time has come to face the music, we need to get this bath done asap and the starting point for this is putting down a new sub-floor and getting updated plumbing in place. 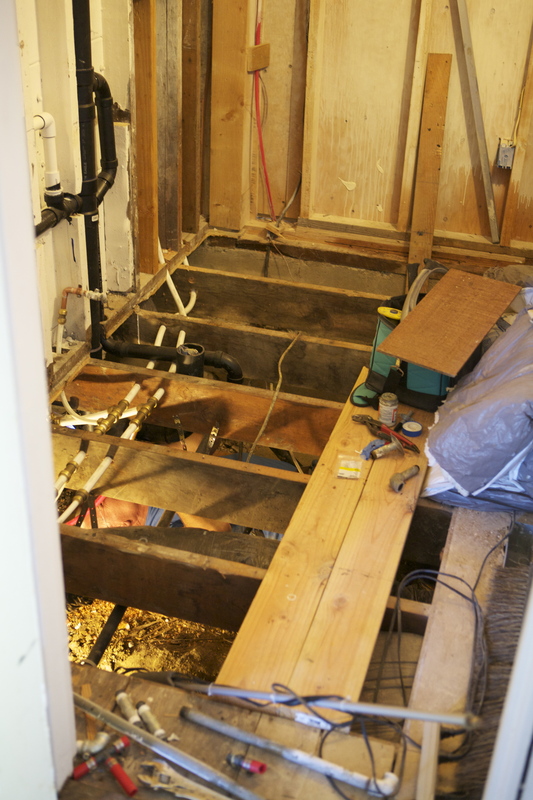 David ripped up the old flooring and gave the underneath a good clean out and then proceeded to renew the plumbing. The pipes (and drains) were old screwed iron ones and we needed to swap them out for code compliant plastic ones! We used shark bite fittings to do this job which made it a lot quicker as they have a push to fit solution on them…according to the man in the know this has revolutionized this task! Can you spot him hiding in the picture above..if not here’s another great angle..
It’s not pretty down under the house that’s for sure. We havent had the spare cash to do a full foam seal on the crawl space yet (something I would love to do for energy efficiency reasons) so there’s still gaps and all kinds of nasties down there! Also we found once looking around that some of the wood was rotten so a couple of bits of that needed swapping out too. With the plumbing all finished we were able to lay down the sub-floor and start the waterproofing process. This was the exact same process we had done on the upstairs bath so I wont bore you with pictures again but if you really want to know you can see that here. Whilst David was busying himself crawling around under our house Jon was putting up closets! 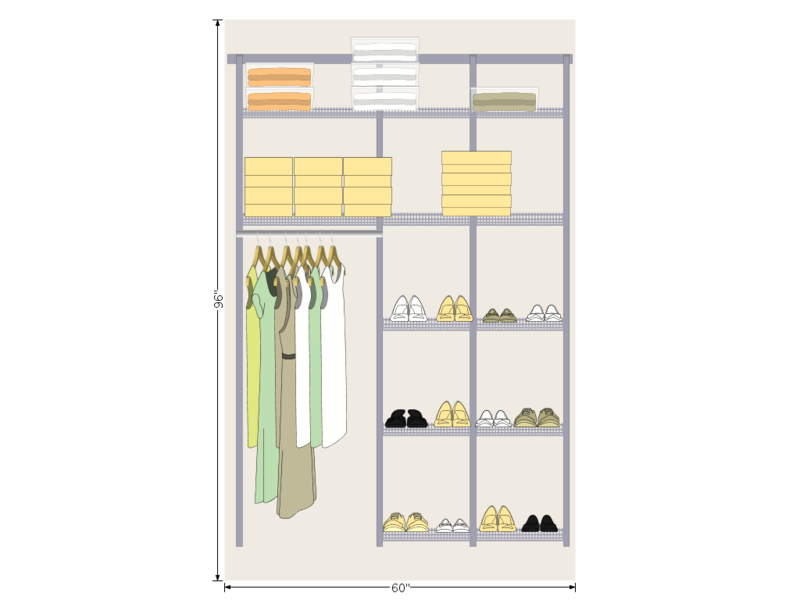 We had decided to outfit the guest bedroom and office closets with Elfa storage systems from the Container Store. They were doing a cheeky 20% off so it was the perfect time to jump on this project. I laid out a basic design online and then took it into the store for refining. If you are ever planning a closet/storage space then I highly recommend doing it this way as the folks in store can get you exactly what you want that messing around online couldn’t. 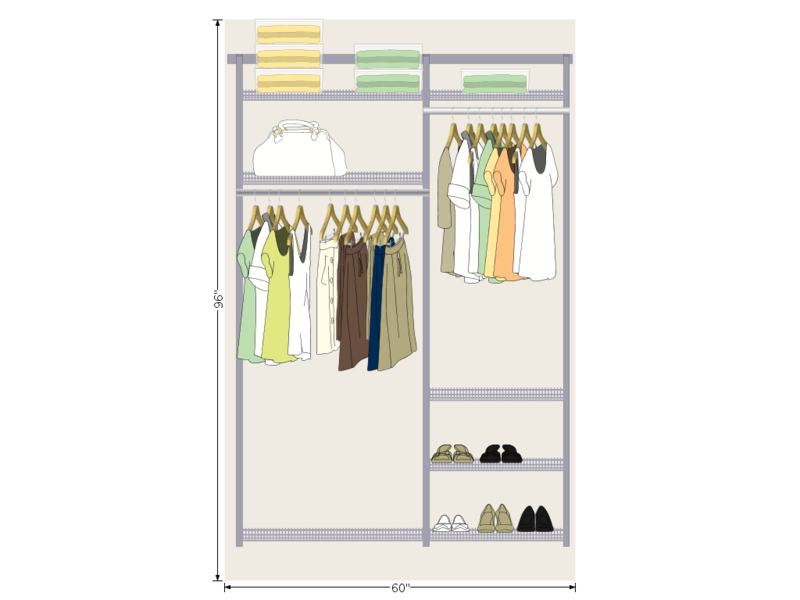 We chose to have more hanging space in here for clothes as our families visit the most and are often here for extended periods of time and so need to be able to hang lots of clothes, along with some space for shoes & folded items. And this is what we did for the office. The office space , whilst also being an additional guest overflow room, is more for us to store things in – like winter jackets and big boxes so we had less hanging space here and more shelves. We also added in an additional vertical bar for extra strength on the closet – given the use case for it. And here’s Jon putting them up. He got them both done within a couple of hours which was amazing. Its pretty straight forward but you must follow the Elfa directions to the letter, use their screws & don’t try to freestyle then you wont have any issues! Our parents were pretty stoked with this development especially as they could now get their clothes off the floor!!! It hasn’t quite affected our storage situation in the house yet, I still have a giant pile of crap in the front room but it’s slowly getting smaller! 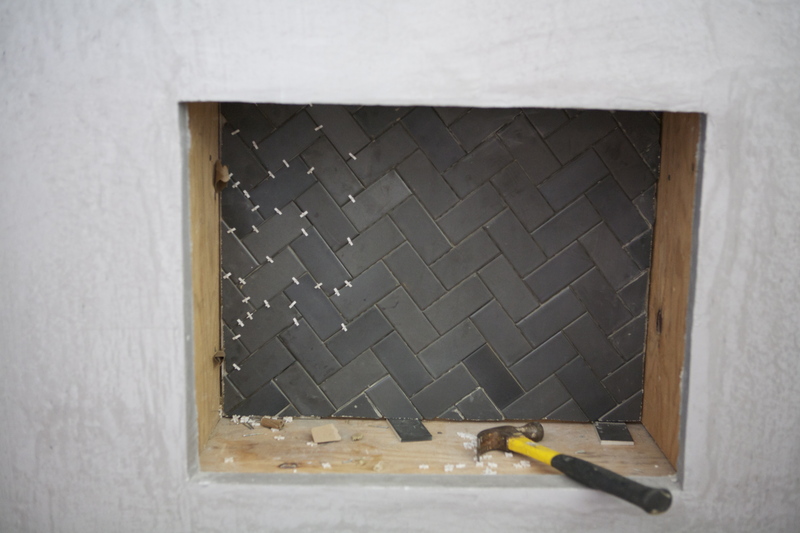 One other small but definitely on the list of things to do was tiling inside the fireplace. We had picked up some great dark grey tiles at Heath Ceramics for this and it was just a matter of taking the time to put them in. To complicate things Jon and I decided we wanted them to be done in a herringbone pattern. So David and Jon laid them out on a board and then cut everything to fit perfectly inside the space and then began putting them on. This looks so good and I am pleased with the way the pattern is coming out and the contrast between the light of the breast and the dark of the tiles. This is quite possibly the most annoying job in the world ever but it’s about to get even worse – we have to get the sides done next!!!! Coming in the next update – a tile-a-thon…..
We are the Howe Family. Juggling family life, full time jobs and a total house & garden renovation on a tiny budget is our daily challenge. This is the record of that journey, our ideas and inspirations that guided us in creating our home sweet home! New Year Tidings and Inspirations …..
Pantone Color of the Year 2013 is…..